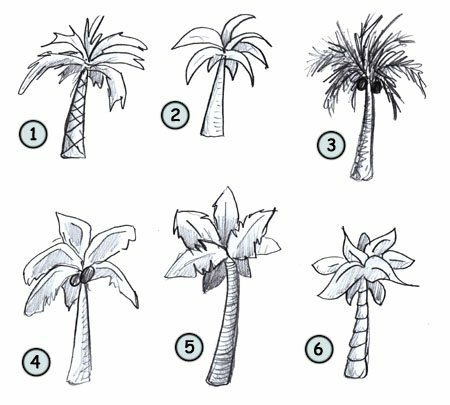 Before learning how to draw palm trees: some fun facts before starting sketching! There is a little more than 2400 different kinds of palm trees around the world. The average palm tree is about 10 to 30 feet tall. 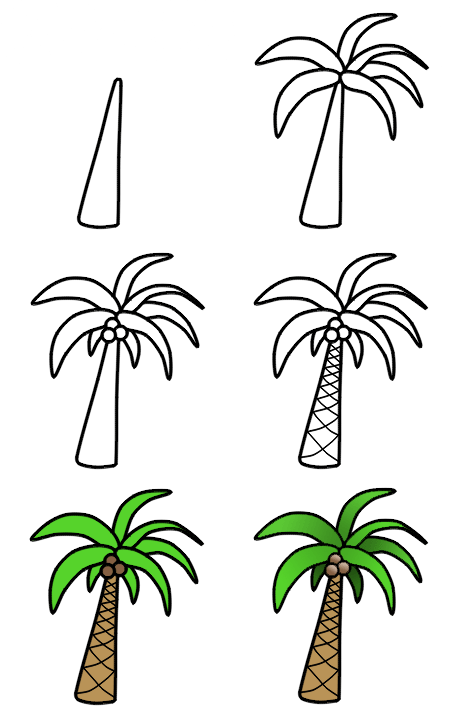 Knowing how to draw cartoon palm trees might seem simple at first. But representing them in a drawing can take many different forms. Unlike many trees, the base of the trunk is often round and smooth (4). The trunk has always a little curve in it (3). Sometimes you will see a little crown shaft (2) on your tree. The crown (1) is always on top of the trunk. Looking at the shapes of our palm tree, we can see that all leaves are really on top of the trunk. Most trees like the pine, the maple or the oak will have leaves from top to (almost the) bottom. 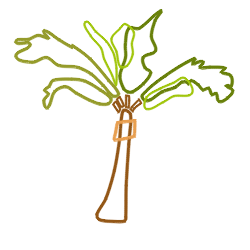 Also, each leaf is big and has an irregular shape. This tree has only five leaves! Ok! 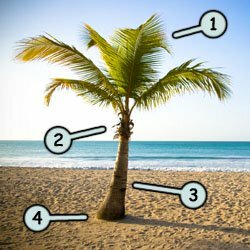 It's time to draw a simple palm tree. First, draw the trunk using a rectangle with round edges. Then, add some leaves. In this example, I added a couple of fruits near the top of the trunk. You can sketch some "x" shapes on the trunk to give it more textures.